This was still a busy week, but less so then last week. I tried a few new recipes, finished up my marketing assistant work for this month and got some blogging done, but didn’t spend as much time blog commenting as I wanted to. Still doing nice with staying ahead, I reached the 40 posts ahead this week and stayed around that number so far. I also have a new tour open for sign-up on Lola’s Blog Tours and working on two more sign-up posts. My mom’s husband got me a new program with which to record VAT and my income and expenses for Lola’s Blog Tours, so I spend some time checking the 2014 document, fixed some things and added a few things that weren’t there yet. The program is pretty simple, it’s just a excel document with lots of formules and tabs and you can see nice summaries and it computes some statistics for you. It was interesting to see I got most of my money last year through blog tours followed by review opportunities and then book blitzes and as last cover reveals. Cover reveals and review opportunities are both my cheapest service, so it was fun to see how those review opportunities still brought me a lot of money on yearly basis. 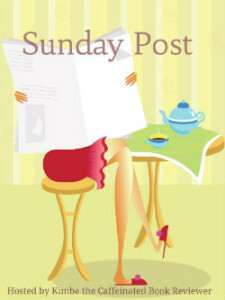 Sunday I received a 10 euro gift card for Kobo from my sister! Yay! I immediately bought two new books with it, Hunt by Rachel Vincent and Owl and the Japanese Circus by Kristi Charish. I am keeping the remainder for when Lion’s Share by Rachel Vincent releases and then we’ll see if there’s anything left. Tuesday we started lowering the dose of Pita her meds. She seems to be doing okay, but not really good yet and she had some moments were she looks really bad. It really varries from moment to moment, she even has some active moments each evening. 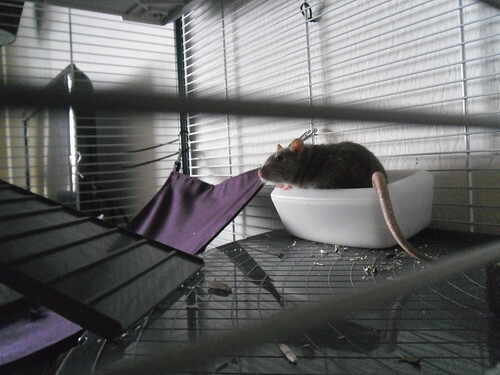 She doesn’t squeak as much as before, only if the other girls groom her (one of them damaged her ear this week). She doesn’t bite anymore either, but for some reason that worries me a bit as it looks like she just doesn’t has the energy to bite. Then on Tuesday evening I got another scare as my eyes hurt a bit after looking at the screen and it seems like I was seeing double. After a while I figured something was wrong with my computer screen instead of my eyes. Everything on the screen had a weird hazy or shadow behind it. The computer monitor is about ten years old, so it wasn’t surprising it’s breaking down. It was a bit better the next day, but I decided it was a good investment to buy a new screen. And wow what a difference it made, I plugged in my new screen on Friday and it really took soem tiem getting used to it. This screen is much larger than the previous one and I am amazed at how many tab I can open and still see everything. It did took me soemtiem to adjust the settings and even now the greens are still a little bit too green, but I figure I’ll get used to it. I finished my fifth book Riding the Odds by Lyda K Scott. It was a fun book. I haven’t yet started my sixth book. I did participate in the twitter chat yesterday evening, it was a lot of fun and I am happy I could participate. This was also one of my goals for this Coyer challenge, so I reached that goal! I am hoping I can participate in the second twitter party as well as it was just so fun chatting with everyone. And I am participating in the scavenger readathon. This is my first time participating in a readathon and to be honest I don’t think I’ll read more then one or two books or maybe even none at all if my moodreader ways steer me wrong. But I really wanted to participate in a readathon for a change, so I am giving this one a try. It starts today and runs two whole weeks! I already picked some books I want to read that give me a lot of points. – Lola’s Ramblings: What does a day in your life look like? When Rhett Carter finally manages to communicate with his cursed father, he wants nothing more than to discover a way to save him. The only problem: The closer he gets to Martin Carter, the faster he’ll die. To help, Laney secretly seeks out Rhett’s father, embarking on a dangerous mission. Unbeknownst to her, she’s followed by Bil Nez, Hex, and Grogg. Separated from Rhett, their lives sit on a knife’s edge. 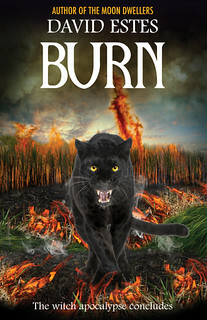 Meanwhile, with bloodthirsty packs of Shifters prowling around New Washington, the only hope for survival is Rhett’s ability to unite the humans and magic-born. A tenuous alliance is formed: the Reaper and his Necros; the Clairvoyants; Floss and her witch hunters; and the humans. But will it be enough to defeat their enemies and restore order to a world in chaos? And will Rhett and Laney ever have the chance for a normal life, a life they both desperately want? Or will the world BURN? Wow! Good job on getting to 40 posts. Haha! I would have freaked about my eyesight too. Glad your new monitor is great. Oh, lucky! I’ve got my eye on the Owl’s book too. Hope its good. They are mostly Lola’s Kitchen posts, but it’s still nice to reach that amount. My goal for this year was to stay around the 20-30, so so far I am doing pretty good! I really got a scare that something was wrong with my eyes. I actually told my sister about the issue and when she took a look at my screen she scared for a bit too. It just looked so weird. Happy with my new monitor, I am getting used to the broader screen and it’s actually pretty nice. I can open so many tabs and see much more of my excel documents at once. I really liked the sound of the Owl book and read soem great reviews about it, hope to read it soon! I hope I can stay around the 40 posts, it’s a nice buffer to have, even if most of them are Lola’s Kitchen posts. Yeah it was a weird experience with the monitor, the effect was really subtly, but really annoying as well. I am glad it was the monitor and not my eyes. I’ll give Pita lots of attention and hope she’s back to normal next week! Sounds like you’re doing a great job of staying ahead of schedule on your posts! 🙂 That’s great! And I seem to horde gift cards. I have an Amazon gift card that I got for Christmas that I still haven’t spent. I want to do it, but I’m holding off at the same time. I don’t know when I became such an indecisive person! 🙂 I can’t decide which books to buy with it! Hope you have a great week and enjoy your new books! Yeah at least with my Lola’s Kitchen posts I am ahead. I love the feeling of knowing I have money to buy something, but as I also wanted to tell my sister I bought some books with it I decided to buy two now and wait for Lion’s Share when it releases in february as that is one of the books I am really looking forward to that I haven’t pre-ordered yet. It can be really hard to decide on which books to buy as there are usualyl so many different books we want, lol. Looks like Smarties just wanted some attention. Your pets are very interesting creatures indeed. Yeah Smarties often wants some attention, especially when she’s active she can run around a lot and then once you get ehr out she probably falls asleep. Another good week for you! A new monitor sounds like a good investment especially with how much time you spend on the computer. 🙂 I’m always surprised how nice it is when I upgrade to a new computer. Screens and monitors get better every year. Yeah I am happy I made the ivestment, the old monitor was really old, but I didn’t notice the difference until I got a newer one. I upgraded to a new computer last year and a new monitor this year, both times I really noticed how much those get better each year, especially when you haven’t upgraded in a while. And this monitor is so thin, it’s a miracle they can fit everything necessary inside that. I was really relieved when I figured it was my monitor and not my eyes, I really had an headache at the end of that day. It was such a nice gesture of her to give my a Kobo gift card! I still have to look into the new VAT rules though, sometimes they make it needlessly confusing. Owl and the Japanese Circus sounds so good and the price was cheap as well, I just couldn’t resist grabbing it. I hope it’s a good book! I’m shopping for a new laptop. Nothing is wrong with mine, but it’s older and I don’t want to be left without one if it does finally go to PC heaven. It’s amazing how fast david writes, I haven’t even started Brew yet (the first book in the series). Hope to catch up on that series this year. Once they are getting older it’s good to start searching for a new one, once things start going downhill it often goes fast. I bought a new pc last year as my old computer was getting old and windows xp wasn’t supported anymore. I wish I was 40 posts ahead! Congrats that’s awesome 🙂 I hope Pita does better this week – it sounds like she could. I’ll keep my fingers crossed. Yay for the new monitor, I bet that was kind of scary though! I would have freaked out if I thought my eyes were going crazy on me! Anywho have a great week! I have Lola’s Kitchen posts shceduled up till the end of the May, so I think about half of those posts are Lola’s KItchen posts, lol. I just have so many recipes I want to share with everyone. We discovered a small wound on Pita today, so I send an e-mail to the vet. It could be a side effect of her medication. I am cuddling with her now. Yeah I was really scared for aminute my eyes had gotten so abd I couldn’t read the text on my monitor anymore. I am really happy with my new monitor, it’s so much bigger then the old one. These books are new to me. I do like Rachel Vincent, but I haven’t read this series. Happy reading! Those 40 posts are spread over 5 different months though, so I am still nto as much ahead as I want to. 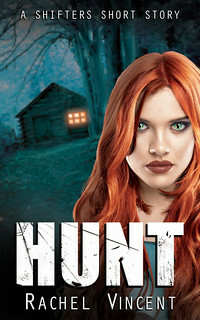 Hunt is a prequel to her new series. In february the first book Lion’s Share will be released. Smarties is so cute! Hope Pita feels better soon. The buckeye brownies sound delicious. I love peanut butter and chocolate combinations. I’m looking forward to reading The Owl and the Japanese Circus so I hope you enjoy it! I have some serious post envy at your 40 posts ahead. I’m trying to get 2 weeks ahead and it’s a struggle. Have a great week! Same here, chocolate and peanut butter combinations are the best. I really liked how the brownies turned out, although next time, I’ll do a smaller layer of peanut butter. It was a bit too much now. 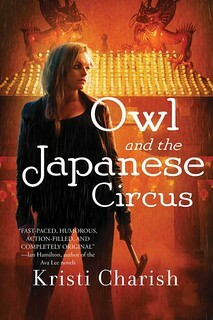 I hope you enjoy Owl and the japanese Circus as well, it sounds like a fun book, I hope to read it somewhere this month. Getting 40 posts ahead really took a lot of effort, but I am so proud of myself. If only I could get a bit mroe ahead with my review posts that would be great. I hope you like Owl. I have heard such great things about this series. Also, I heard Owl is really a normal girl, no superhero stuff. That makes me want to read this really bad. Yeah I heard that as well and I think it’s such a fun twist to have anormal human as a mc in a paranormal series. I hope I get aroudn to reading it soon! 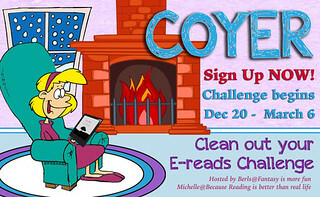 That COYER readathon looks fun, I have not been doing very good w/ COYER this time. I love the treasure map image, too cool. I just finished my 6th book for Coyer and the first oen for the readathon, so I am doing okay. I think I am going to reach my goal of reading 8 books during Coyer. 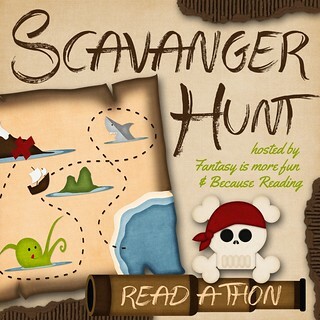 I agree the banner for the scavenger hunt readathon is awesome! Dang, you go! I thought we were ahead at 20 posts but you are rockin’ it at 40! I’ve heard a lot about Owl and the Japanese Circus, hope you enjoy it 😀 And >< Poor Pita, I hope everything works out. Smarties is so cute! I've only had hamsters and guinea pigs. I was pretty happy to have reached that a few months ago I was at 20 and I am happy to have been able to up that number, even though most of them are recipe posts. I read some good reviews of Owl and the Japanese Circus and it sounds like a book I would enjoy, so I just had to grab it. I hope at the end of next week she off her medicine. We’ve been lowered the dose slowly, but it’s difficult to tell if it’s working or not. Wow, 40 posts ahead??? My mind is seriously blown! I feel pretty on top of things if I’m a week ahead, haha! Big screens are seriously the best! I’ve gotten too used to mine at my office though since now I feel like I can’t work on just my laptop screen at home, boo! That’s the weird thing, while I am 40 posts ahead, I am only a week ahead in total. Most of the other posts are Lola’s Kitchen posts scheduled on each Friday up till the end of May. I never realized how handy a big screen could be until I got one, I can see so much more of everything withotu scrolling! Yeah it was really scary for a moment, until I realized that everything beside my screen still looked normal. You’re 40 posts ahead! That’s fantastic! I try to hold steady at 20, but it doesn’t always work out that way. I really want to read Hunt before Vincent’s Shifters spin-off series hits shelves next month, and Owl and the Japanese Circus is another time that I NEED to make time for. I hope you have a killer week! My plan was to hold steady around 20 as well, but I have so many recipes I want to share, so I just keep scheduling them. I amnot sure yet whether I want to wait with Hunt until Lion’s Share is released or rea dit now. I am so excited for this spinn-off series as I loved her Shifters series. I saw Owl and the Japanese Circus on your blog twice and on a few other blogs and it sounds so good! I hope I can read it soon. I’m super impressed that you are so many posts ahead. It’s a lovely comfort zone to have. I’ve been maintaining about 15 and even that amount feels great. Yes it, although it’s a bit addictive and every time I reach a new number I want to stay there. I think 15 is a great amount, that’s about two weeks worth of posts! I actualy surprised myself and read a book in one sitting yesterday. It’s fun so far! I’m sorry Pita still isn’t back to her own healthy self, I hope she’ll continue to do better. Have a fantastic week, happy reading, and good luck in the Scavenger Hunt. The VAT stuff isn’t too difficult yet as I am not making too much money yet, but it’s a neat program and I love seeing how much money I make from the different type of tours and it makes do the yearly VAT easier as the program computes everything for you. It probably will take another week before we’re sure if she’s getting better. Hunt is the prequel novella for her new spinn-off series of the Shifter series. I love her Shifter series, so I am really excited for this spin-off. Just finished my first Scavenger Hunt book yesterday evening, so that’s a good start :). Smarties is so cute 😉 it’s fun as well to capture those moments. I love gift cards, and book related ones are the best. I don’t often have the chance to capture those moments, so I was happy to have the chance now! And I agree book related gift cards are the best! You did have a busy week, Lola! Thanks for sharing photos of Smarties – I just shared them with my older daughter. Soo cute! I’m jealous of your book haul…I really want to read Hunt. And Owl… I hope this week has gone well for you! That makes me happy to hear you shared the picture with your older daughter. 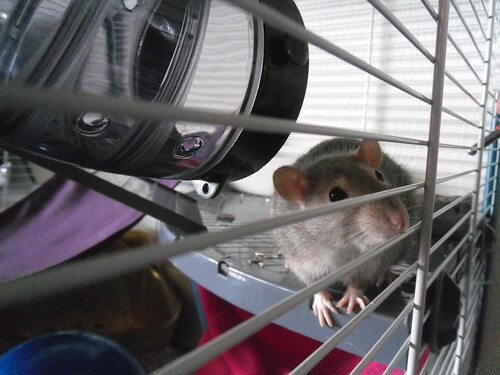 I am hoping that more people realize how fun rats are as pets thanks to me sharing cute pictures of them ;). I am really excited for both Hunt and Owl. I think I’ll wait with reading Hunt until I have Lion’s Share. I am hoping to read Owl soon, it sounds so good!